The past few days have been rather different as far as weather is concerned. 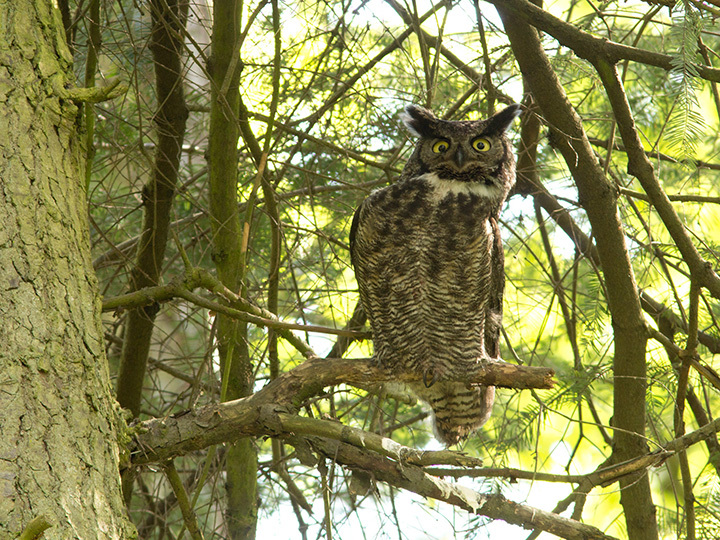 Wednesday night was extremely rainy, and when I went out to see the Great Horned Owls on Thursday morning, they were sopping wet! 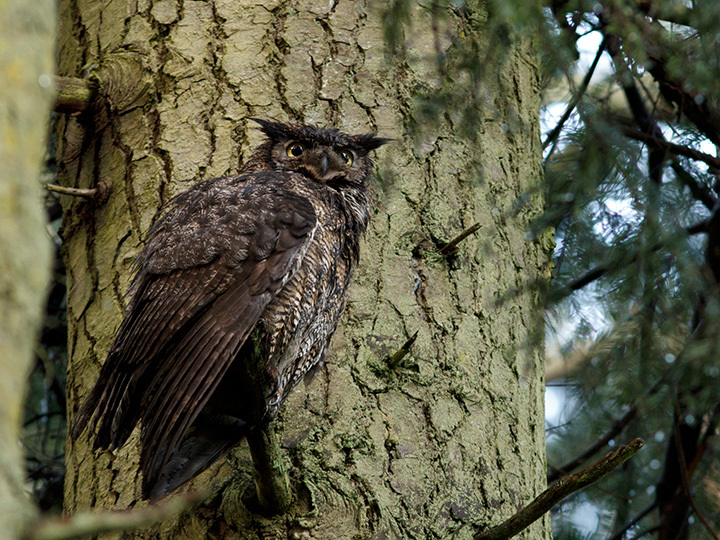 There was some excitement, with a raven flying in too close, and requiring a chase-off by both the male and female. 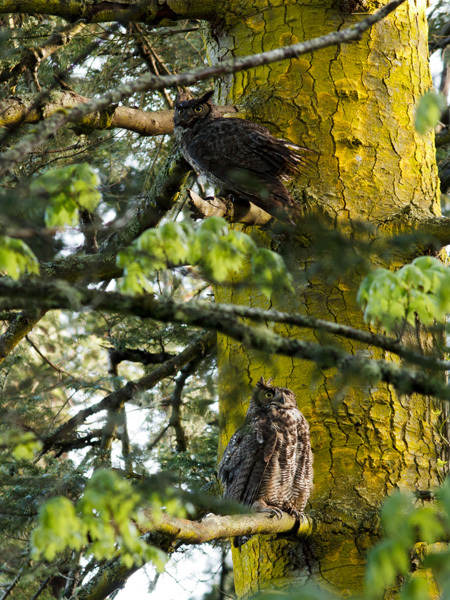 After the raven was safely away, the male (top) and female (bottom) owl perched together in a tree. I normally never see them together like this during daylight hours. Here is a video of the two interacting. 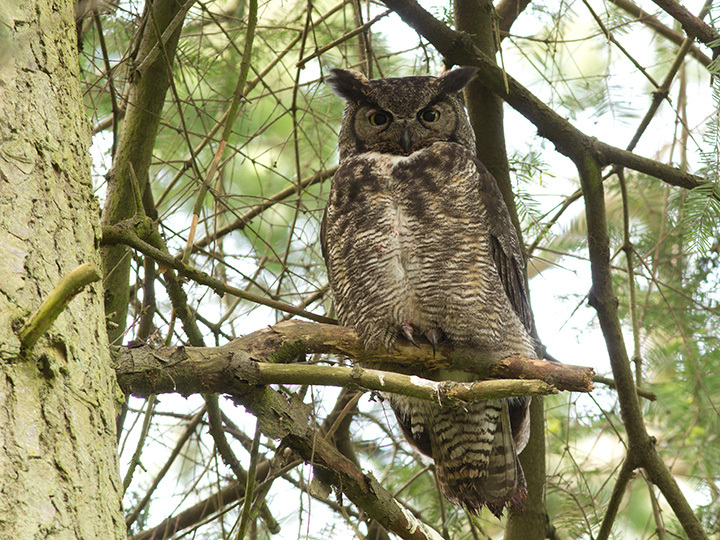 On Friday morning, when I got to the nest, I found the male owl with his tail feathers soaked in blood. Whatever he killed the night before must have bled a lot! 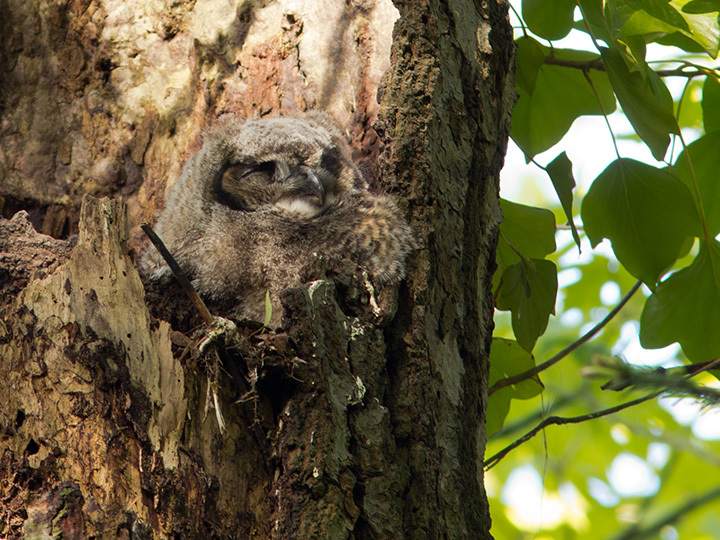 Meanwhile, both the mother and the chick were perched on the very top of the nest stump. You can see how big the chick is already! 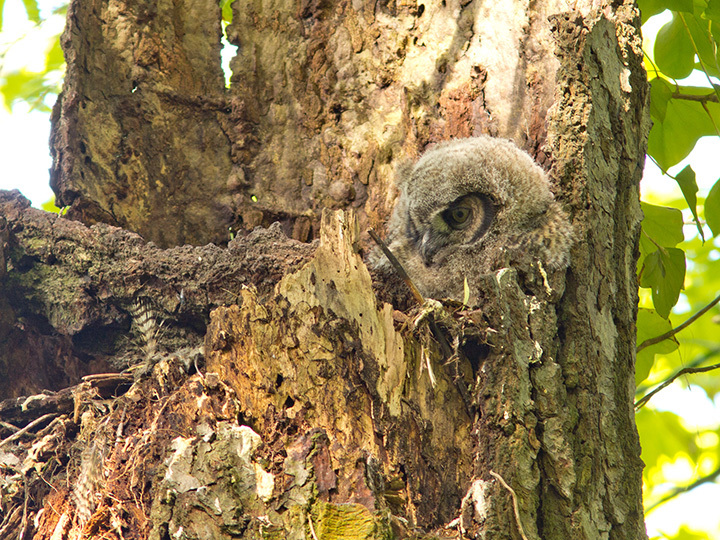 I went back later in the afternoon to try to shoot in some better light, but of course the owls were mainly sleeping. 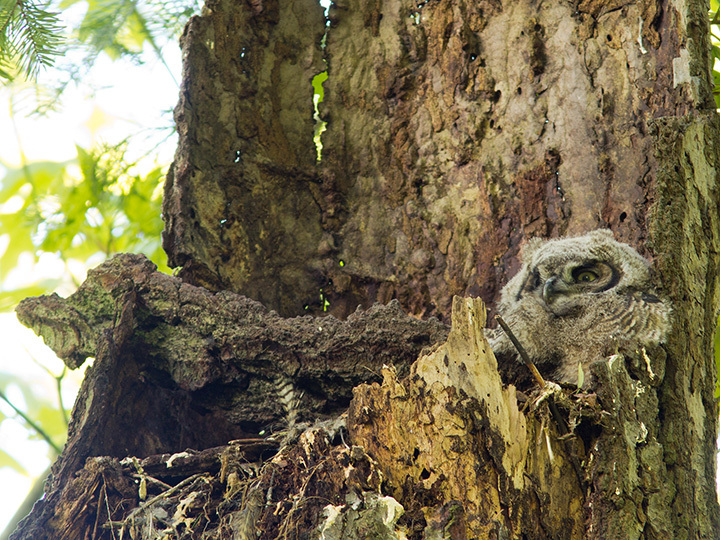 The male got quite excited upon seeing a Cooper’s Hawk fly by the nest. This time, it didn’t require a chase. I also noted that his blood-soaked tail was now clean. 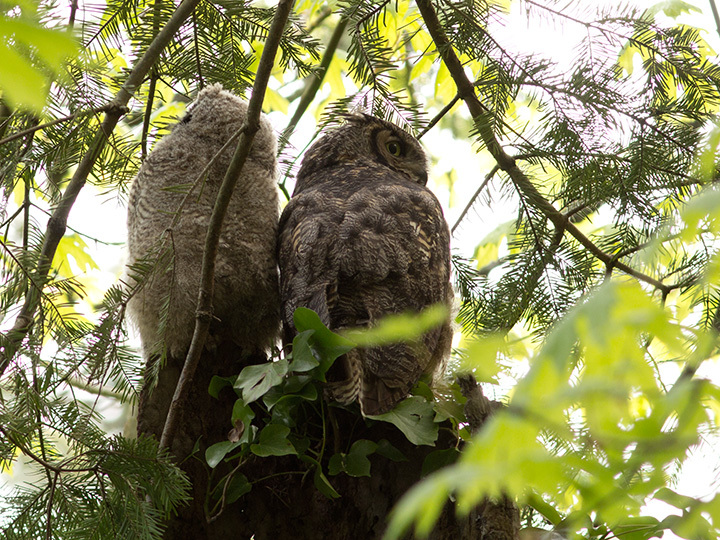 I found that shooting in the better afternoon light allowed for crisper rendition of the chick’s plumage, but at the cost of blowing out the sky. Crisp rendition or no, this chick spent most of the afternoon snoozing, perhaps dreaming of large rats. ← Practicing for wildlife photography with dogs!